From protein bars to agave nectar, these 10 "healthy" foods might be the cause of—not the solution to—your health problems. Check out these 10 foods—from protein bars to agave nectar—that are commonly regarded as healthy options, but are actually far from it. Granola can be found on every brunch menu across the country, sandwiched between ricotta pancakes and Belgian waffles. Granola has long been lauded as the healthiest breakfast option around, but the honor is often misplaced. Though homemade versions can be good for you, be wary of store-bought brands that are loaded with sugar and packed with calories. Take, for example, Bear Naked's GO BANANAS… GO NUTS granola, which contains 560 calories per every 1/4 cup serving. Not all protein bars are created equal. Most people don’t need an additional boost of protein in their diet, even those of us who work out steadily. That said, protein bars are a quick and easy way to sustain hunger on the go. The problem is that many brands of protein bars contain around 300 calories, and are full of artificial ingredients and sweeteners. Some protein bars—like the PowerBar ProteinPlus Chocolate Brownie flavor—even pack more sugar than a candy bar (a whopping 30 grams). 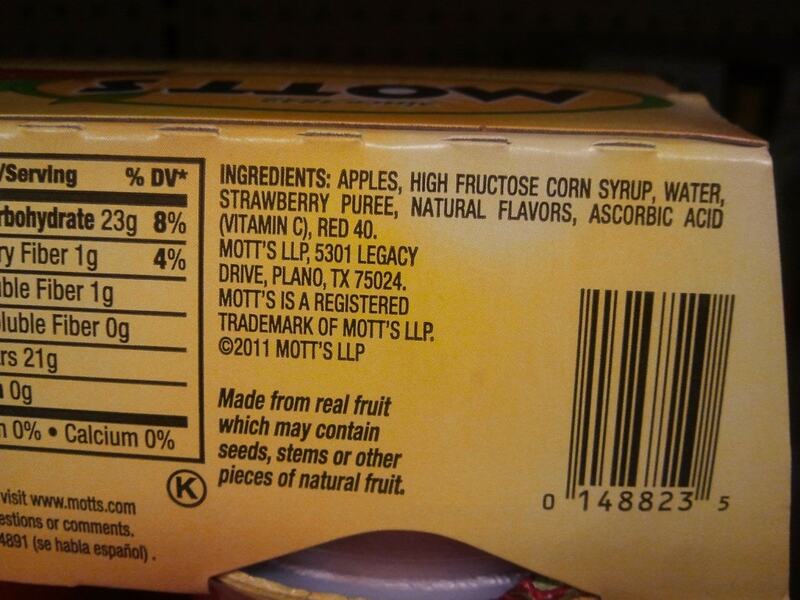 Who doesn’t remember eating Mott’s applesauce as an afternoon snack as a child? The single-serving plastic cups were thought of as a quick way to get your daily fruit fix. Sadly, the seemingly innocent sauce is loaded with high-fructose corn syrup and, in some cases, food dye like Red 40. Consuming products with high-fructose corn syrup can lead to a bevy of health problems, including obesity, high blood pressure, and diabetes. While sneaking one package of Mott’s—which contains 22 grams of sugar—won’t kill you on the spot, it’s best to go for organic brands, or to take ten minutes out of your day and make your own. Agave nectar has been one of the best-selling health food products on the market, claiming to be an all-natural, raw, sugar-free sweetener. While many people are sure to conjure up images of drinking margaritas in Mexico at the mention of the agave plant, agave nectar was only popularized here in the 1990s. The highly processed syrup is far from raw, and it can have up to 20 calories per teaspoon—the same as white table sugar. Not only is agave nectar on par with sugar, it also contains between 70-90% fructose, making it even worse than high-fructose corn syrup, which comes in at around 50% fructose. In the sea of pastries offered at your typical morning meeting, the bran muffin seems like a healthy choice. Bran on its own is chock full of fiber and protein, but the health benefits come with baggage when made into muffin form. Both Cosi and Starbucks versions of bran muffins clock in at 350 calories per muffin, and a staggering 430mg and 520mg of sodium, respectively (that's roughly a quarter of your daily sodium intake). At that point, you might as well slather it with frosting and call it a cupcake. Diet soda has long been touted as being a healthy alternative to regular soda, but these so-called diet varieties are loaded with artificial sweeteners like sucralose and Stevia. Artificial sweeteners can disrupt the body’s natural ability to regulate calorie intake based on the sweetness of foods, which can lead to overeating. Downing just two or more cans of diet soda a day can actually increases a person's chances of becoming obese by 500%. A study from the University of Minnesota in 2008, which tracked the eating habits of 9,500 participants over the course of nine years, also found a series of other issues associated to the consumption of diet soda: drinking just one a day can lead to a 34% increase of metabolic syndrome, a group of risk factors that increase your chances of getting a stroke, heart disease, and diabetes. Sure, Vitaminwater does contain vitamins, but the candy-colored drinks contain 33 grams of sugar in one bottle, more than a 12 ounce bottle of Coke. 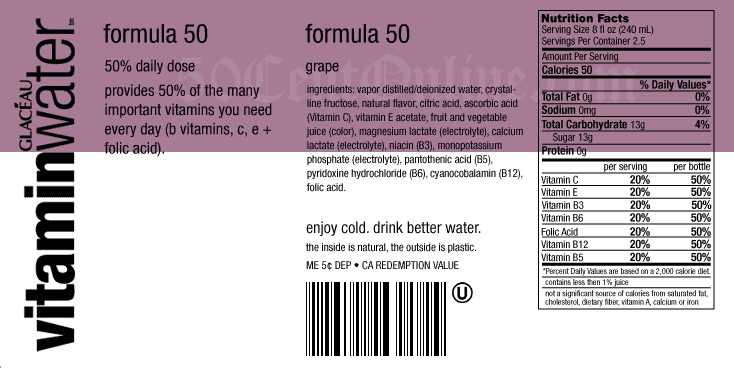 Note that the 13 grams of sugar listed on the label is only for eight fluid ounces, not the whole bottle. In 2010, Coca-Cola—who owns Vitaminwater—was sued by the Center for Science in the Public Interest for its deceptive advertisements and labels that make Vitaminwater look like a healthy drink. Coca-Cola’s legal team responded by saying, “No consumer could reasonably be misled into thinking vitaminwater was a healthy beverage." If you really want flavored water, try adding a slice of lemon, lime, or cucumber in your regular water for a healthy (and more affordable) alternative. Low-fat yogurt may top the list of deceptive foods at the supermarket. Just because the label says so doesn’t mean that Yoplait's Boston cream pie flavored light yogurt is actually good for you. The fat count is reduced, while the amount of sugar and additives is doubled. On top of that, most yogurts contain so little fruit that they’re boosted with artificial coloring and sweeteners to compensate. In the past few years, it seems everyone and their mother has jumped on the gluten-free band wagon. For those 2 million people who have been diagnosed with celiac disease or a gluten sensitivity, gluten is a very real problem. But a large percent of people who are opting to eat only gluten-free items in hopes of losing weight have been highly misguided. That sudden weight loss you encountered may be from cutting out a midnight slice of pizza and slice of chocolate layer cake. Many gluten-free alternatives for products like pasta, pizza dough, and baked goods are made with refined grains, which contain very few vitamins or minerals. Another faulty assumption is that gluten-free products are inherently healthy, but often times products will be laden with more sugar and sodium to mask the unappealing flavor. Just one of Glutino's sesame seed bagels has 440 calories and 620mg of sodium, while one cup of Udi's granola has 520 calories and 20 grams of sugar. With more and more people shying away from dairy products, soy milk’s popularity has soared in recent years as a healthy and all-natural alternative. The only problem? 93% of the soy grown in the country is genetically modified and loaded with residue from Monsanto’s RoundUp Ready spray. Soy milk is rich in phytoestrogens, which can mimic the body’s estrogen production causing lower testosterone levels in men, and infertility and a higher risk of breast cancer in women. To clarify, not all soy is bad. Soy products that have been fermented to remove harmful toxins, like tofu and tempeh, are still great sources of protein, but if you’re looking to avoid cow’s milk, it’s best to forgo soy milk for another dairy-free alternative like almond milk.